This beauty handles like a high-end performance race car. The only problem with the new Hunt Harrier 25 Sport—and this is a serious one—is that it’s addictive. Once you climb behind the custom wooden wheel and nudge the throttle forward, the boat just comes up on plane —no hump, no bump…nothing but steady power and speed. The mid-range acceleration is simply outstanding, and when you carve the first turn, it’s so much fun that you want to carve another, and then another. This latest Hunt is a combination of a Porsche 911 and the Energizer Bunny. The performance is so exhilarating that you just want to stay behind the wheel and keep on going. The fact that it’s a Hunt, with a C. Raymond Hunt deep-V hull and blue-water pedigree, is just icing on the cake. The first thing I noticed about the new Harrier 25 Sport is the very cool-looking windshield. Somehow it’s a combination of classic/retro and high-tech, all wrapped into one. “We spent a lot of time on this,” said Peter Van Lancker as he put down a chamois while we talked. The hands-on company president was helping to wash the boat before our sea trial. Even though it’s owned by ScoutPartners—the same company that bought Hinckley Yachts a few years ago—Hunt still defines its own corporate culture by doing one thing, and they do it very well. They build a relatively small number of semi-custom New England-styled boats from 25 to 80 feet that are all designed by C. Raymond Hunt Associates using the performance, sea-conquering principles and deep-V hull developed by the legendary Ray Hunt more than 50 years ago. In case you missed this part of yachting history, Ray Hunt designed the iconic Bertram 31, the legendary Boston Whaler 13 and 17, and in his spare time, the Concordia yawl, arguably one of the prettiest sailboats of all time. All that goes to say that Hunt builds boats that are meant to be classics—not a lot of frills or bells and whistles here. These are solid ocean-going performers that will take you out⎯and bring you back⎯no matter what the conditions are off shore. That’s not to say that Hunt yachts don’t have a lot of built-in luxury and technology when appropriate. It’s just that with Hunt, first things come first. As we headed down Narragansett Bay toward Newport, it was easy to see that the new Harrier 25 Sport takes advantage of its heritage. Indeed, it has the same hull with 24-degree deadrise at the transom as all previous Harriers. “We’ve built probably 1,000 Harriers,” Van Lancker said as we cruised into a 15-knot headwind. “We know we have a successful hull. 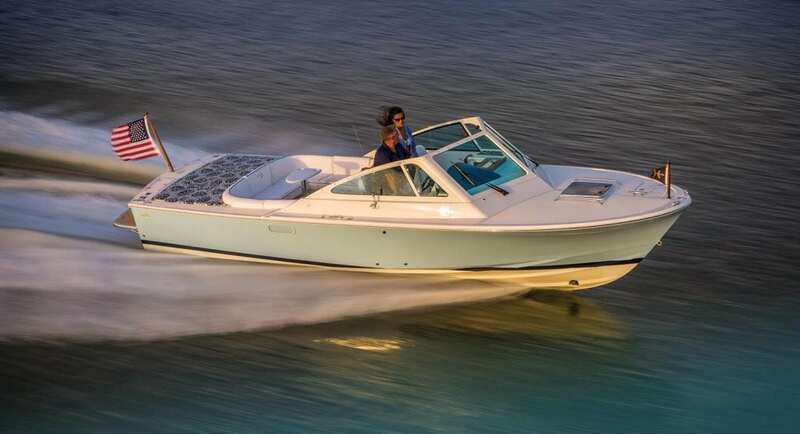 What’s new is the style of the boat.” Above the waterline, Hunt redesigned the boat starting with its aggressive composite windshield and ending with the 3×7-foot sunpad in back, above the 380-hp Volvo gas engine (an upgrade from 320-hp gas Volvo that’s standard), paired to an OceanX stern drive. “We put the engine in back for better balance,” Van Lancker said. “And there’s no engine box.” There is, however, a supersized wraparound six-person back seat that starts behind the passenger seat on the port side and ends at the new wet bar with sink and fridge just aft of the driver’s seat on the starboard side—a great place for a group of friends or family to relax. The real news about the Harrier 25 Sport is that less is more. There’s no exterior teak here. The boat is made to be used and enjoyed. “It’s a wash-and-wear boat,” Van Lancker says. Not even the wide swim platform is teak. Instead, it’s fiberglass with synthetic teak inserts. The cuddy cabin, which has a convertible V-berth and a manual head, has a faux teak and holly sole. All this adds up to a boat that manages to keep its traditional Down East looks while requiring minimal exterior maintenance. It can serve variously as a sport boat, a fishing boat, an overnighter, or as a water sports platform (it even has a retractable water ski pylon), and then you can put it away. We were on Hull #1, so we wanted to see how the boat would perform. With three people on board and half a tank of fuel, we registered 41.5 knots going into the headwind at 5,250 rpm. But more than that, the attitude of the boat and the cruising comfort were remarkable, even in less-than-ideal conditions. “Look,” said Kristan McClintock, Hunt’s marketing director who was sitting all the way aft. “I’m perfectly dry.” Indeed, there was no spray or water anywhere inside the boat, a remarkable performance considering the 15-knot headwind. The boat’s flared bow, lifting strakes and hard chines managed to deflect all the spray. Turning around and going downwind we picked up another 1.2 knots of speed, but the comfort level remained the same. I put the boat through a series of tight turns at speed, and Volvo’s twin, three-bladed counter-rotating props did their thing, biting in, responding instantly to the throttle. Over the years I’ve driven Hunts from the Florida Keys up to the Reversing Falls at the top of the Bay of Fundy in Saint John, New Brunswick, so I pretty much knew what to expect. Still, the Harrier 25 Sport’s performance was both impressive and memorable. I definitely did not want to go back to the dock. Hunt offers a variety of engine options on this boat, from the standard 320-hp Volvo gas stern drive up to a 430-hp Volvo gas stern drive, a 300-hp Volvo diesel stern drive or even a 300-hp Yamaha outboard. With any of these, you know you’re getting one of the most time-tested hulls in the world. But with the new Harrier 25 Sport, you also know you’ll be getting time to use and enjoy the boat. It’s a different approach, but if the idea is to maximize the fun time and to minimize the not-so fun time, it’s definitely the way to go.